Little Lines, a photo by carolinearmijo on Flickr. I have been attracted to little lines and patterns lately. 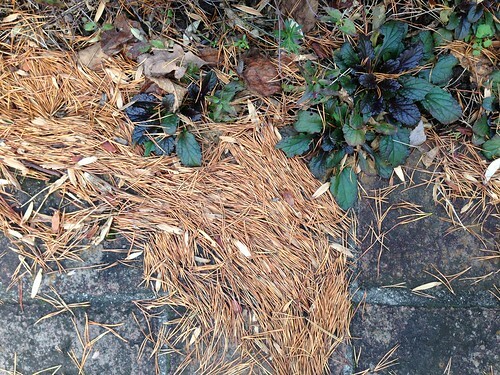 The fallen pine needles stopped me in my tracks last week. Today I took a similar picture of wood grain on top of a paint splattered stool at ArtQuest. I took a picture thinking it would be a cool something, but I need my real camera to do anything with it. Today was much harder on my gift to self list. I’m working on a fort I started at ArtQuest. I’m not sure, but I maybe quitting on it. Did I say I had to create something new or just work on some art each day? I think the latter. Plus I have one more bottle of water to drink and a Tai Chi video. Or maybe bed would be my best gift.